Okay, I never end up going full abstract, but every now and then I just kind of want to go wild and see how far I can take a subject towards abstraction by slathering on the paint with a palette knife. Acrylic on 1/8" panel, 10" X 8"
Not only was I trying to find the limits of representational abstraction here, I was also trying to simplify. 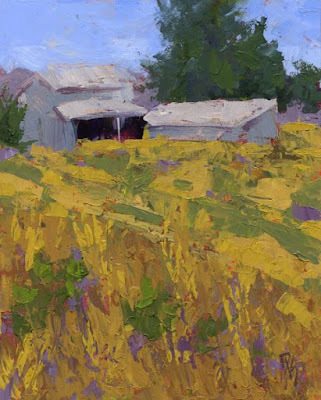 The foreground "grasses" point up into the diagonals of the "field" which draws the eye to the distant barns which are backed by trees, mountains and sky. The painting has lots of color interest in it without hitting you over the head with it. I used a photo I took while exploring the rural back roads of Spanish Fork, Utah as my reference. I think I came pretty close to my goals with this painting, it's pretty simple and abstract while having plenty of that palette knife induced texture I love.